Playing To Win: Steam Sale! Ah the Steam Summer Sale. For those of you without a Steam account, you should get one. It's like an online store, you buy digital copies of games from them and can play them on any PC where you sign into Steam (a bit like the XBoxOne's original plans, but without all the complaining). Those of you who've had bad experiences with Steam 6-7 years ago, around Counter-Strike 1.0 era, it's moved on an awful lot, it's actually quite good now. On to the Sale. Again for those who are new at this, it's a period of days where tonnes and tonnes of games are offered at discount rates. This is your chance to finally buy the games you wish you'd had the cash to buy before. However it is quite addictive, and can be quite costly. You see all these games that look awesome and they're only £5 each and suddenly you've blown a week's wages buying indie games that you'll never play twice. To get the most out of the sale, it's important to recognize the different types of sales and when it's Ok to buy games (or when you're better off saving your money). First, there's a global discount, applied to (almost?) all games. The discounts for these games usually run between 25-75%. Avoid these, there's a chance they'll be cheaper at some point as a daily or flash deal. Next, there are daily deals which put games on sale for 24-48 hours. These are usually discounted at 50-75%. These aren't likely to be offered any cheaper, so feel free to buy. 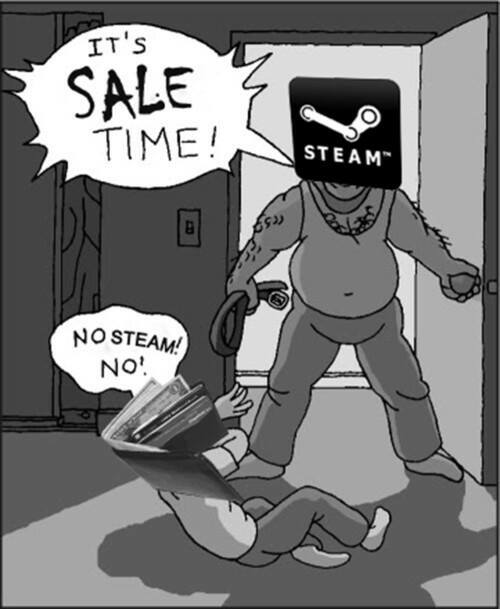 Next up, there are flash sales which put games on sale for around 12 hours. I don't think you'll find a product cheaper than it is in the flash sale (unless you're willing to wait a few months), buy them if you want them. There's also community deals which are voted via poll by the users of Steam. You can get some big titles here at large discounts, again worth buying if you want them. Finally, there's the bundles. Huge collections of games bundled together by publisher, era, genre... These are excellent value - you won't find the complete collection of games cheaper. However, if you only want to play 1 or 2 games - they may appear individually cheaper throughout the sale. Here's the important bit. If you miss out on a daily deal or flash sale, don't buy the game anyway. There's usually a "Final Day" offer which runs, surprisingly, on the last day of the sale. On the last day, all the previously offered deals tend to appear, giving you a final chance to grab a bargain. So hopefully that's helpful to someone. I'm sure I'll post an update with some of the goodies I've bagged myself later on in the month.